If your company is preparing to hire new employees then it is probably a good idea to have a decent idea of exactly how much money it takes to train a new employee. Without some help it is almost impossible to come up with a reasonable estimate for training costs, fortunately this training budget template can do just that for you and your company. Obviously, everyone requires different things for training a new employee and as a result the costs will vary greatly, that is precisely why this training budget template was made to be completely customizable with almost no work. It takes only a few seconds to change or add categories so that you can quickly and easily change everything to match exactly what you need it to be. Probably the best thing about this training budget template is that it is free to download, free to use, and incredibly easy to use, so there is no monetary investment required and almost no time required either. Getting started with the training budget template is as possible; simply open it up like any other Excel file and you will already see a bunch of preloaded expenses. Add or remove any categories or groups that you won’t need and then add the actual cost or budget information and the template will handle everything else from there. The template is already broken down into quarterly sections and once you have input the required data it will show the estimated budgeting costs for each quarter of a year of training. Overall the training budget template is incredibly easy to use and it will only take a few seconds to get started with it. Once all of your budget and cost data is entered into the spreadsheet the cost will immediately be calculated and displayed so that you can adjust or change training requirements to reduce cost if necessary. 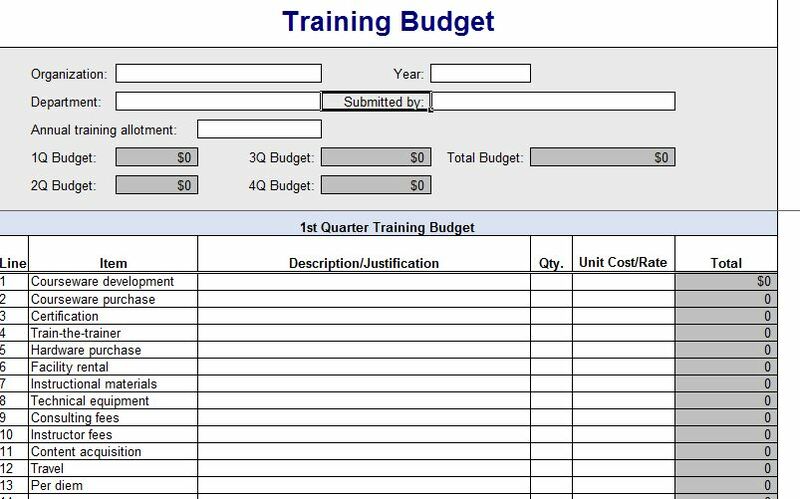 There is no simpler training budget calculator available and this one is free, so it is absolutely worth downloading and trying out; it might just be exactly what you need to get a good budget estimate created.